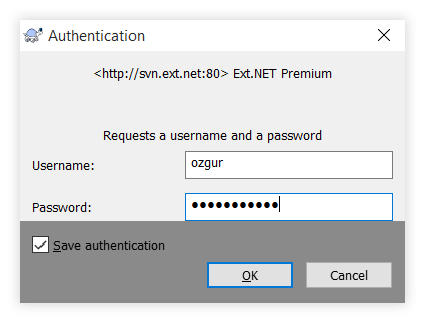 Ext.NET SVN source code repositories are available to our Premium Support Subscribers. During the subscription period, Premium Support Subscribers will have a read only access to all prior releases as well as the current release. You can use the links below to connect to a branch. Tortoise SVN is an Apache Subversion (SVN) client and we recommend it to connect to SVN server. Here are some steps to get you started if you’re not already familiar with the it. settings should be good for most cases. Once the installation is complete, we can clone the Ext.NET repository we like. For this tutorial we will clone “trunk” which is the development branch for current Ext.NET version. Now right click on “trunk” folder and if Tortoise SVN is installed successfully you should see additional menu items for Tortoise SVN. Choose “SVN Checkout…” and a pop-up window will open. 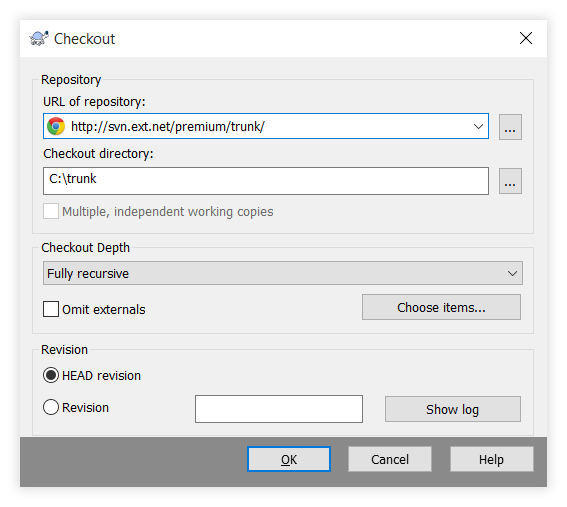 In the “URL of repository” field enter “http://svn.ext.net/premium/trunk/” which is the URL of “trunk” for Ext.NET SVN source code. do not need to change any other settings on this window. your credentials. Please get in touch with us if you haven’t received or if you are having connection issues. your local copy or cloning other Ext.NET branches. Finally click “OK” and Tortoise SVN client will begin downloading the files inside “trunk” folder. Now you have the source code files for current working branch for the latest Ext.NET version. As this is the working branch, we continuously make changes and update these files. This means that you should update the files any time you need the latest version of the files. Updating your local copy is very simple and straightforward with Tortoise SVN. Just right click on “trunk” folder and choose “SVN Update” and wait for your SVN client to fetch and update all the changed files for you. And that’s it! Now you can always access the latest development version of Ext.NET!